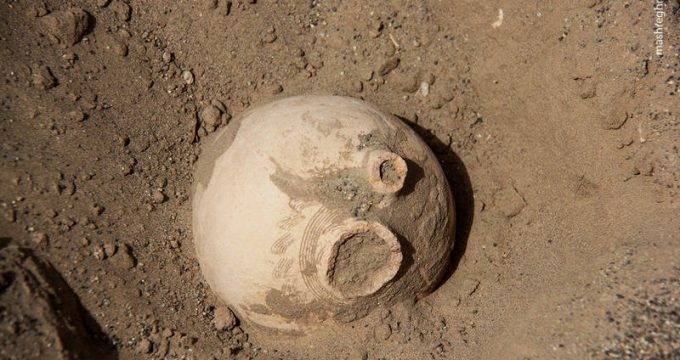 Press TV – A tremendous sandstorm that swept across part of Iran’s southeastern province of Kerman has led to the discovery of several historic artifacts dating back to centuries ago at a dig site. Fahraj Governor Gholam Reza Nejat-Khaleqi said the archeological site, located 248 kilometers southeast of the provincial capital city of Kerman, became visible for the first time when the sand dunes, which once covered them, were moved away in the storm. Nejat-Khaleqi added that law enforcement officers had cordoned off the area, and that archeological experts had to survey the site to determine its exact age. The photo shows human skeleton bones found following a sandstorm in Fahraj, Kerman province, Iran, on April 5, 2017.